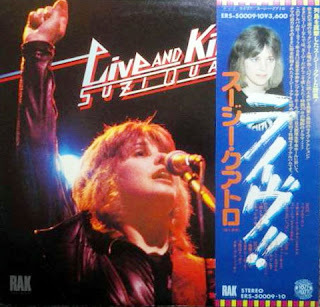 "Live And Kickin'" released in Australia and Japan in 1977. The album recorded live at Nakano Sun Plaza Hall, Tokyo June 12th, 1977 at Osaka Kosei-Nenkin Kaikan, Osaka June 15th, 1977, during Suzi's 1977 tour of Japan. A great album, and a reminder of just what a powerful performer Quatro was.